Tom is back putting players head-to-head in Versus. Today he looks at premium midfielders who are potentially under-priced. Tom is back putting players head-to-head in Versus. Today he looks at premium midfielders. When it comes to Fantasy, there’s no question Dyson Heppell‘s name deserves to be in and around elite status. He entered the competition via pick number 8 in the 2010 Draft and made his debut in round one the following season. From the get-go, it was clear ‘D-Hep’ was to be a cult-figure at Windy Hill. Heppell, who played a lot of his draft year off the half-back line, wasted no time in getting started. He was a key member of the Bombers midfield and defence and ended the year with 22 games under his belt and an extremely good first year average of 84 Fantasy points. The threat of the infamous second-year-blues didn’t faze Heppell, whose courage, contested ball winning, tackling and leadership shone through once again, impressing the red and black faithful. He even managed to improve on his yearly average by 1 point. Dyson’s position fluctuated from DEF/MID in 2011 to straight DEF in 2012 before he regained his dual position status the following year. Since 2014, however, Heppell has moved into a more permanent role in the midfield where he clearance winning is a constant feature. In that same year, he managed to go the extra mile and crack the Fantasy ton for the first time, averaging 106. He also capped off a fairly brilliant year by winning his first Crichton Medal as the club’s best and fairest and being named in the All-Australian team. Heppell then averaged 101 in 2015 but, as was the case with the majority of his older teammates, was ruled ineligible to play with the club in 2016 due to the bans put in place by WADA. Heppell was linked with a move away from Windy Hill at times during the year but, the loyal, level-headed star was never really going to move from the club he looked destine to captain, was he? Throughout the year he spent his time learning about the world of real estate and managed to refurbish an entire house and sell it. Fair to say he won’t have the time to do that this year. No-one quite knows how Essendon and their players will perform in 2017. Some believe the year off will put them at the back of the pack. However, others think the break will have them primed to fire. Of course, because he missed the 2016 season, Heppell was awarded with a 10% discount, meaning he is likely under priced by around 15 points. Although he has at-times struggled with a tag, teams may look to concentrate their attention on the dangerous Zach Merrett. Heppell is over $100k cheaper than Neale, Treloar, Parker and Merrett yet has the ability to average more than any of them. There’s a good reason why he’s selected by half of the competition. Dayne Beams made the move back home from Collingwood to be the Lions figurehead. However things haven’t quite gone to script so far. Beams has played just 18 games in his two years at the club. Originally drafted by the Magpies with pick 29 of the 2008 Draft, Beams captained the Queensland Under-18 side in his draft year and developed his trade at the Southport Sharks, on the Gold Coast. Making his debut in round 2 of his first season in the AFL system, Beams immediately impressed, averaging a healthy 75 Fantasy points for the year from 16 matches. He then averaged 87 the following year, on his way to helping the Melbourne club claim the flag after infamously playing out a draw with the Saints a week before. Beams is another case of the third year breakout in which, despite his Fantasy ability being known, he managed to average 101. But in 2012, Beams elevated himself to genuine elite status. He took out the B&F, was included in the All-Australian team and finished in the top ten at the Brownlow Medal. The tattooed midfielder averaged a cool 116 Fantasy points in the process. Dayne, the brother of fellow Lion Clay, spent another two excellent years in Victoria where he avergaed 101 and 107 before he headed home for Brisbane. Pick 5 and Jack Crisp were sent the Pies way in exchange. Beams is known for his ability to win the contested ball but also impacts the scoreboard, kicking 129 goals in his 128 game career. Unfortunately, due to injury, we haven’t seen much of the midfielder who, on his day is one of the best going around. As a result of playing just the two games in 2016, Beams receives a massive discount which brings his starting price down to $519,000. You only have to look at past seasons results to realise that’s a good 20 points under priced. Of course there is risk involved with picking Beams. There’s risk attached to anyone coming back from injury. However, as was mentioned above, he is priced well below his potential output if he can stay fit. He has a high ceiling, consistency, proven Fantasy ability and likely won’t stay at $519,000 for long. Verdict: I am aware that Beams is the more cost-effective option in this comparison but I am leaning towards the Bomber in this one. Both Dayne and Dyson had next to no impact in 2016 and they will be raring to go once round one roles around. Some believe the banned Bombers will be underdone but I think the opposite. In my opinion the club will be pushing for a finals berth, led by Heppell of course. Both players have shown they have elite Fantasy traits but I’m more weary of Beams’ troubled injury history than Heppell’s absence from the AFL environment over winter. Don’t be afraid to lock both in though to free up some extra dollars. Let’s just say, things didn’t quite go to plan for the Brownlow Medallist this year. It started off rather sourly, a 15 possession and 54 point outing against the Dogs. However back-to-back 120’s against the Suns and Eagles, followed by 137 point haul against the ‘Roos seemed to have guided his season back onto the right track. Not to be. Nat Fyfe was struck down with injury half way through the clash with Carlton and never managed to return. Fyfe is viewed by many as the leagues second or third best player behind Dangerfield and perhaps Marcus Bontempelli. On the Fantasy side of things, he has the two of the three basic elements that make up an elite player, in my mind. He has consistency (Hitting the ton almost every match he played in in 2015) and ceiling (proven by his three scores of 120+ in 2016 despite playing five matches) but has never managed to play every game in a season, spending time on the sidelines either through injury or suspension. However lets hope Fyfe is over the injuries that have plagued him in the past and shows a bit more discipline, for the sake of his Fantasy owners primarily. Read into this to whatever extent you wish, considering every players seems to kill the pre-season, but all reports coming out of the purple camp hint that Fyfe is smashing it out of the park. However as a leader of a club who will no-doubt be looking to make a return to finals, you’d expect him to be setting the example. It’s obvious that when fit, Fyfe is a Fantasy gun. He will average over 100 in 2017 and is under priced rather significantly. Injury would have to be the only thing putting you off! What’s not to like about Bulldogs ace Marcus Bontempelli. He’s can literally do it all. When in the middle, his cleanness around the packs and efficient use of the ball cut the opposition to pieces. When up forward, Bontempelli is a constant threat. He is a regular on the scoreboard and will be looking to improve on his 2016 average of 98. Personally, I think 98 is a minimum for The Bont in 2017 who, with added experience and a new piece of silverware, will be expected by many Fantasy coaches to at-least hit the ton. Last year didn’t get off to the greatest of starts for Bontempelli. He didn’t crack three figures until round seven and his early form included a 55 and 59 against the Hawks and Blues respectively. I’m sure coaches would appreciate if he continued where he left off at the end of last season. He was tagged in just about every game, understandably given the effect he can have on the game, the opposition and his teammates. However taggers were simply unable to stop the former Northern Knight from wreaking Fantasy havoc. As was mentioned above, in round seven the tides began to change. He inflicted 122 on the Crows and 105 on the Dees a week later before collecting 32 disposals, 4 marks and 4 tackles on his way to hitting the Giants for 106 at Spotless Stadium, although GWS got the four points in the end. These two teams would meet here again in September with the scoreline a little different. Bontempelli managed 30 touches, 9 tackles and 125 points in the Dogs 83-75 win over the Eagles at Etihad. From this point on, Marcus failed to ton up on just three occasions, with scores of 129 and 137 lifting his average to something more respectable from a player of his quality. Teams will try to tag him out of the contest, or at least quell his influence, but last year he showed he has the ability to break the tag. I believe he can be averaging around the 103 point mark but I would not be surprised if he upgrades to elite status. Verdict: We could just be comparing the second and third best players in the comp here and both are without a doubt very Fantasy relevant in 2017. Despite having to sit out a large portion of the year with injury, Fyfe has a more proven Fantasy resume and is more likely of the pair to average 115. Nat does come with risk but you won’t find him available for $595,000 all that often. “Bont” and “under-rated” don’t go together. What bout luke shuey 2k more, I reckon he has a greater scoring potential then the bont but no one seems to be talking bout him. I agree that Shuey has a hypothetically superior fantasy game, I guess it’s been visible for like 5 years now (How long ago was that 5 goal 35 touch game? ), but for whatever reason he’s just never taken that extra step, I’m starting to think it won’t happen for reasons that are beyond me. He has the role and ability and the “under the radar” quality you love in a fantasy player, but he just hasn’t burst through several years in a row and I can’t get the gut feel to expect it to suddenly happen now. There is no chance that Merrett will get tagged over Hep D. No one tagged him over bloody Zaha last year haha. And I don’t see Fyfe as a 115 average guy, absolutely a jet player but his highs aren’t that high in Fantasy, he’s more of a mini Pendles. Will get a decent score each week but I don’t see him being in the super high end with his game. Bont still feels a little young to me, his age and attention and Fyfe style shape and performance just doesn’t lend itself to lazy cheap scores. 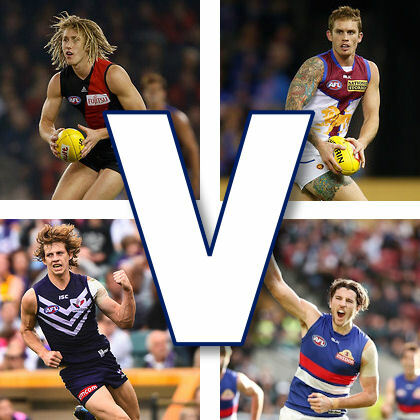 Luke Parker, Nat Fyfe or Bont? Fyfe might average 110 but it won’t be over 22 games that’s for sure. Don’t know how many coaches want a premium sitting out 6+ games for the year. Too injury prone for my liking.